In this small village of 4,000, where the Christian community totals 135 people, these small acts of their faith are not only a statement of their own beliefs but also an important way to instill in their children a love and understanding of the importance of their religious traditions to their own identities. The village’s Christian community includes 14 Greek Orthodox and 25 Melkite Catholics, all of whom are served by the Latin-rite Church of the Transfiguration, the only church in the village. All of the Christians belong to three large extended families: the Shunnara, Saed, and Sahouri clans. “We are all a close family in this community. We know everyone from the youngest to the oldest,” said Suhad Shunnara, a schoolteacher who moved to Muqeibleh when she married. There are pros and cons to living in such a small community, she added. “We celebrate all the holidays together, but there are not enough girls (for the boys to marry). All the Muslims love us; I teach in a Muslim school and they come to us on our holidays, but they don’t know anything about our religion. They think we pray to a statue,” she said. Ramez Saed, 39, said in the village’s simplicity there is mutual respect among the residents. For example, he said, during the month of Ramadan, Christians respect their Muslim neighbors by not eating outside of their homes during fast times. They also do not drink alcohol, which is forbidden by Islamic law, outdoors. He said he believed this does not challenge their Christian faith, but is an expression of it. The first priest came to the village 30 years ago and Mariam Saed, 62, remembers how, as a young mother from a different village, she helped gather the community together to teach them the correct way of praying. Every night she would read Bible stories to her nine children. Her husband, Tawfik, 64, who was born in the village, said the first time he stepped into a church was on their wedding day. In those days, he said, people were Christian only in name. “Now we have a church, thank God,” Mariam Saed said. The parish’s church was built in 2006 with international financial assistance, and Muslim religious leaders and neighbors came to celebrate with the community. Muqeibleh is the only village with a Christian presence between the city of Lod, in the center of the country, and Nazareth, Fuad Shunnara noted proudly. Guanellian Father Marco Riva has been serving the community for the past seven years, dividing his time between Nazareth as director of Holy Family Center for Special Education and the parish in the village at the foot of the Gilboa Mountains. Father Riva said he hopes the eldest Saed son, Julian, 12, who plays the piano, will become the church organist when he installs a new organ next year. Two years ago Father Riva began arranging for the community children to be taken to a Catholic summer camp in Nazareth. Next, he wants to turn a barren field behind the church into a soccer pitch for the community’s 50 youngsters. Even in a place where relations are excellent with neighbors, it is important to create a sense of community among the Christians, while at the same time not isolating them from the rest of the village, he said. Isahk Sahouri, 43, called the Italian priest a force to be reckoned with. “He loves us and we love him and he wants to give to this community,” said Sahouri. 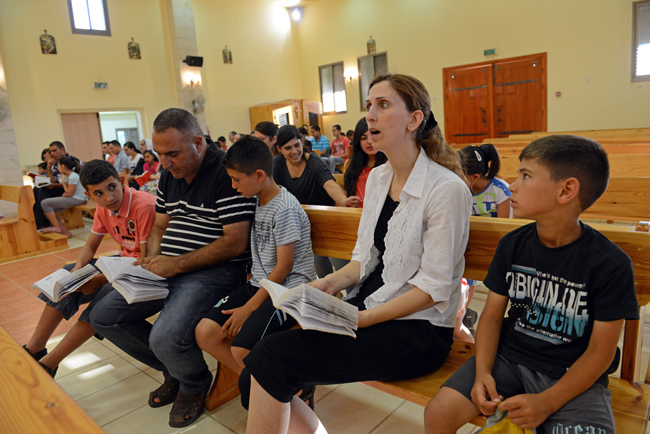 Living in such a small community gives a different meaning to attending Mass and holiday services, said his Nazareth-born wife Lilach, 37. He said some of the young Christian families are considering leaving for Nazareth because of a lack of educational options for their children as they reach high school age. Parents must decide between sending them to the local public high school, which offers only Muslim religion class, and driving them to a private Catholic school in Nazareth. “It is a matter of time before the Christians leave this village,” he said, noting the many hours he spends on the road taking his sons to school in Nazareth and after-school activities. His son, Amir, 12, said that although he likes being with other Christian children in his school, he loves his home in the village.